Keep the battery securely mounted. Keep the battery top clean and dry. Keep the terminals and connections clean, tight, and coated with petroleum jelly or terminal grease. Rinse any spilled electrolyte from the battery immediately with a solution of water and baking soda. If the vehicle is not going to be used for an extended time, disconnect the battery cables. Hydrogen, a highly combustible gas, is always present in battery cells and may explode if ignited. If any electrolyte gets into your eyes, flush your eyes with clean water for at least 15 minutes and get immediate medical attention. An inappropriately disposed battery can be harmful to the environment and human health. Dispose the battery according to your local law(s) or regulation. Never attempt to recharge the battery when the battery cables are connected. Failure to follow the above warnings can result in serious bodily injury or death. When you don’t use the vehicle for a long time in the low temperature area, separate the battery and keep it indoors. Always charge the battery fully to prevent battery case damage in low temperature area. If you connect unauthorized electronic devices to the battery, the battery may be discharged. Never use unauthorized devices. 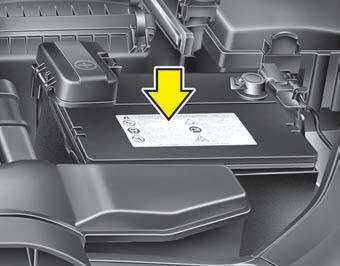 Separating the battery from the vehicle should be done in an authorized Kia dealer.